While we plan to include these metrics in DeepCrawl by default soon, a quick method to get these into your crawls now is using our custom functionality. Once you've decided which performance metrics you'd like to see in your rendered crawls, we need to capture these using a two-step process. The above step will dump the performance statistics into the DOM of your pages as we crawl them. The next step is to extract these into custom extractions. 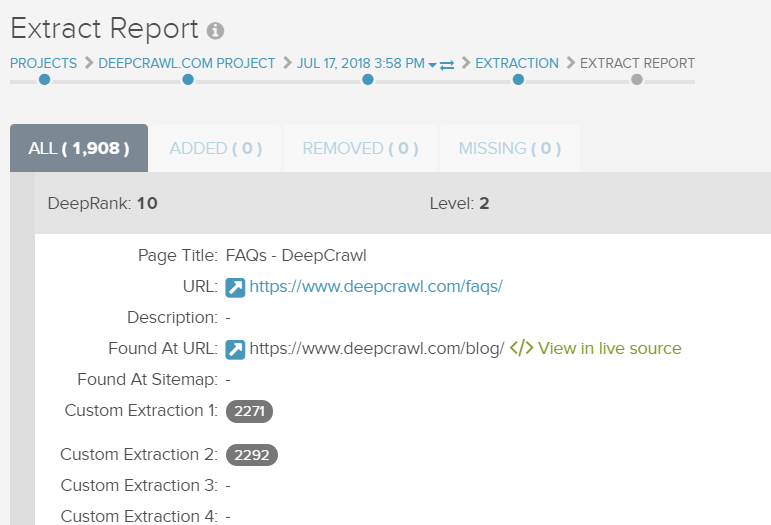 Once your crawl has run, these metrics should be available in both the "Custom Extraction" reports, and the "All Pages" export. The performance metrics are in seconds from the beginning of the render. Why are these metrics different to the ones in Google's CrUX/PageSpeed Insights/Lighthouse/etc? Performance metrics are a way of breaking down a page's rendering lifecycle. These metrics tend to fluctuate as several factors can delay or speed up a page's rendering (such as network load, server performance, or arbitrary factors like which ads happened to load). DeepCrawl makes measurements while a page is rendering and saves these to be analysed later. As we render all pages from similar machines on the same network, this can provide a good comparative benchmark and gives insight into the pages which perform the best or worst across your website. However, because these metrics are so specific to the hardware and network that the page was rendered on, you may find that there are discrepancies when retrieving the same data from other datasets such as Google's CrUX report, or Lighthouse run on your own computer. Google's CrUX report is based on renders across hundreds of user's machines; while this dataset provides a good overview of the average performance of a page, but the data can not necessarily be used to compare the performance of different pages (as different samples of users will be used for each page's metrics). A similar discrepancy will happen if you run Lighthouse on your own computer - the performance metrics will vary with the performance of your hardware, the other apps and webpages that you have active, and the types of browser plugins that you're using.